Kinshasa, 30 September 2018: The DRC President has symbolically burnt 1,050 kg of ivory and 1,197 kg of pangolin scales. 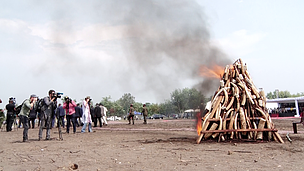 The official ceremony of ivory tusks and pangolin scales burn took place in Kinshasa. In addition to ivory tusks and pangolin scales burn, the DRC Head of State has released some gray parrots, one of the most poached species in the country. «Through this action, the DRC confirms and reaffirms today its commitment in the fight against environmental crime. We wanted to demonstrate that now ivory, parrots, and pangolin scales markets have no reason to exist anymore » said ICCN Managing Director, Cosma Wilungula. For the Congolese Institute for the Conservation of Nature (ICCN), this incineration ceremony is a strong message towards poachers and smugglers in the country and around the world. In his speech, ICCN Managing Director also informed that at least 15 tons of ivory tusks were seized in the country as the result of fight against poaching and illegal trade of protected species in the DRC. "15 tons of ivory represent at least 5,000 killed elephants. We wanted to show that it is useless to continue killing okapis, elephants, pangolins since they have no more market value now, " he added. The European Union Head of Delegation in the DRC, Mr. Barte Ouvry praised the DRC efforts, through ICCN, in the fight against wildlife crime. The EU Ambassador to the DRC promised his institution's support to these efforts to ban protected species illegal trade. 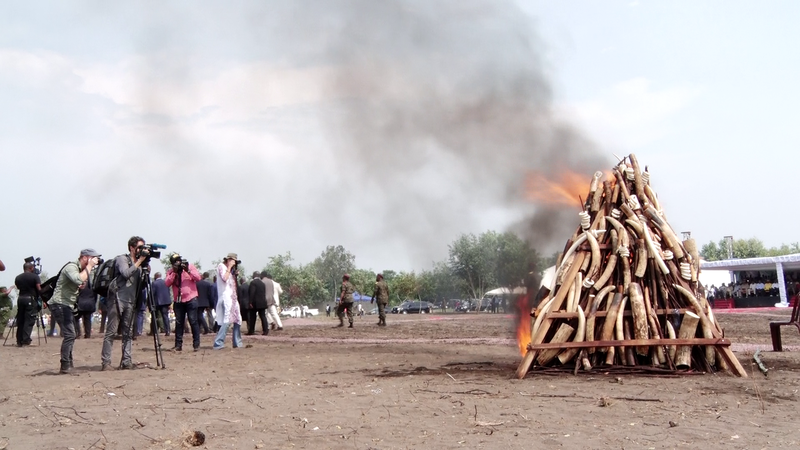 Moreover, it should be noted that last June, the Garamba National Park had burnt all its ivory seized stocks. Facing multiple difficulties including that imposed by poachers, this park is going through dark moment of its history, with the disappearance of its outstanding fauna. Today, Garamba has barely more than 1200 elephants and 48 giraffes.